Conservation of nature is very pivotal and scientists have already given clarion call regarding Mass Extinction in near future. Many nature documentaries reveal the importance of every resource that nature has bestowed us, yet humans have paid a deaf ear. We are seeing a world where many species are getting pushed onto the brink of extinction and that’s a disgrace. We have made this planet a sterile world of steel and concrete only to sustain ourselves at the cost of other species. This never is a pessimistic view but there should be importance and equality paid towards the environment and that’s where the contributions count commendable. The Department of Botany organised a painting competitions on the eve of World Nature Conservation on day 28-07-2011, in order to explain the importance of nature and our role to protect the nature. Hence is this idea of leading students to put them on to their thoughts to protect our nature ;The Department of Botany organised drawing competitions to all the students of Andhra Loyola College on the eve of WORLD NATURE CONSERVATION DAY on 28-07-2011 on the topic "SAVE EARTH" in order to give awareness on the nature and its importance. 50 students have participated in the competition. 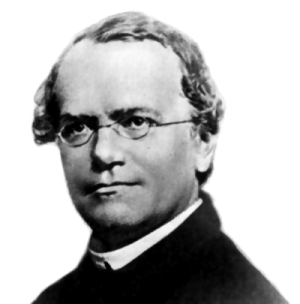 Mendel is the Father of Genetics. from his works on Pisum plant he put forth the concept of Hereditary character into the lime light. The Department of Botany and Micro Biology on the eve of memorizing the reminiscence of Mendel's on 20th July that is his birthday , by organizing an Essay Writing Competition on" Conservation of Bio-Diversity" for all the students of the college . 80 students pertaining to different branches participated in this event. students were filled with Mendel and his works which was well explained by the staff. The flowers of Calabash tree, native to Central and South America, are pollinated by bats. These trees, even if planted here, rarely bear fruit. But such a botanic miracle occurred in the gardens of Andhra Loyola College (ALC). Orchids of genus Vanda, which thrive only in highly humid conditions, rarely bloom even if they are grown in a garden in a hot and dry place such as Vijayawada. In yet another marvel of the natural world, the plant went into bloom in the herbal garden on the campus. The greenery in the ALC has become like an oasis for nature lovers in the city, which is fast developing into a concrete jungle with rapid felling of trees for the construction of high-rise buildings and widening of roads. The college campus has several trees that are over 50 years old (the institute was established in 1953). The Jesuits, who run the institution, and the faculty working in it have been protecting the biodiversity and added new varieties to it. Right in the middle of the college, car parking is a magnificent specimen of the Cannon Ball Tree (Latinname: Couroupita guianensis , local name: Nagalingam tree). The campus has several excellent specimens of the Indian Rosewood (Delbergia sp. ), Copperpod or Rusty Shield (Pterocarpus sp. 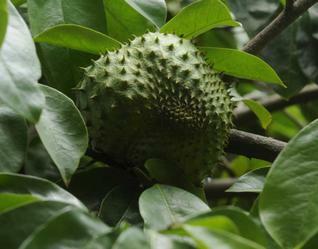 ), and other trees found commonly in the Indian forests. The Lakshmanphal tree, the upcountry cousin of Sitaphal, is the proud possession of the college. The Flora of Andhra Loyola College, a scientifically drafted list of plants, has over 500 species of plants. Head of Botany Department B. Siva Kumari, who authored the Flora four years ago, says that the number of species on campus has increased to 550 and the book which has all the taxonomic details have to be revised. The botanic garden with 70 medicinal plants and 35 rare plants was developed to teach the students with the help of live examples. A garden with plants that belong to different taxonomic classes and families is a luxury few educational institutes can afford. “In this section of the garden we have planted all the polypetalous plants and in that section are all the gamopetalous plants,” she explains. Though teaching is her primary duty, Ms. Siva Kumari spends time every day keeping track of the growth of the different plants. The college management has been very supportive in developing the botanic gardens, she says. Vanda tessellata is a genus in the Orchidaceae , it is one of the most important florally.These are mostly epiphytic. Many Vanda orchids are endangered, because of habitat destruction. The genus has a monopodial growth habit with leaves that are highly variable according to habitat. Some have flat, typically broad, ovoid leaves while others have cylindrical, fleshy leaves and are adapted to dry periods. The stems of these orchids vary considerably in size; there are miniature plants and plants with a length of several meters. Useful part : Root, Leaves. The Department of the Botany organized a guest lecture on 'Traditional medical systems in India on 8th July, 2011 at seminar hall. The programme begin with the Words of welcome by Rev. Fr. A. Francis Xavier, Principal and the theme of the subject explained by Mrs. B. Siva Kumari, Head, Department of Botany. 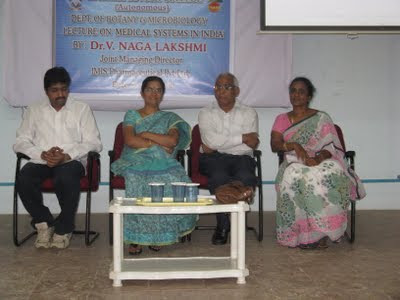 Dr. Naga Lakshmmi Manageing director of IIMS pharmaceutics pvt. ltd Vijayawada delivered a lecture on opportunities in pharma industry and also the importance of various medical systems in India in treating ailments. The programme ended with the vote of thanks proposed by Mr. K. Bala Chandra, Head, Department of Microbiology. Traditional medicinal systems such as ayurveda, which see ‘health as a state in which the individual is in a state of physical, mental, and spiritual equilibrium', are making a comeback, IMIS Pharmaceuticals Pvt. Ltd joint managing director V. Nagalakshmi has said. She has a doctorate in pharmacology. 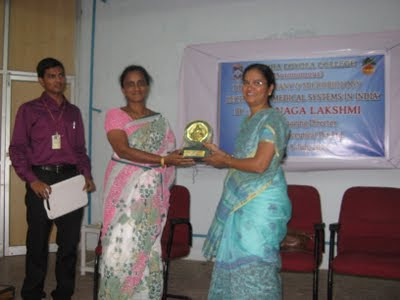 Delivering a lecture on ‘traditional medicinal systems' to botany and microbiology students of Andhra Loyola College here on Friday she said that a look at the history of medicine showed that experts were recommending people to get closer to nature for a healthy life. Listing milestones in the history of health care, she said about 4,000 years ago the first physicians prescribed roots for different ailments. A thousand years after that roots were considered heresy and prayers were offered to cure people. With the development of different types of remedies in 1850 AD, prayers were dismissed as superstition and various potions were administered as medicine. In 1940 potions were dubbed as ‘snake oil' and the medical community shifted to ‘pills' and later in 1985 pills were set aside because they were ‘ineffective' and antibiotics became popular. Since 2000 AD the antibiotics were being discouraged because they were artificial. After 4,000 years roots were again in vogue because they were natural, Ms. Nagalaksmi said. The definition of health according to World Health Organisation was “a state of complete physical, mental, and social well-being and not merely the absence of disease of infirmity,” she said. Listing homeopathy, naturopathy, unani, siddha, varmakalai and ayurveda as the important traditional medicinal system that were popular in the country, she said that the rich diversity in the systems was a sign of progressiveness. Different systems were effective to different people based on their general constitution. Most of the traditional medicinal systems used raw material from natural sources unlike modern medicine, she said. Rev.Fr.Dr.A.Francis Xavier principal of A.L.C Botany H.O.D Mrs.B. Siva Kumari and Microbiology H. O. D Mr. K. Bala Chandra were present.